NYR Children's Collection, 9781590172919, 40pp. The little hero of this tale has a shock of blond hair, a devoted dog, and a frisky cat, but today he has a problem, a big problem, in fact: he’s just too big to do the things he wants to do. He’s too big to put on his little hat and coat, too big for his mother to pick up, and too big to ride around on the dog’s back. Luckily he’s not too big to dream of the time when he’ll be big enough to relish the challenges ahead and to set out on bold new adventures of his own. 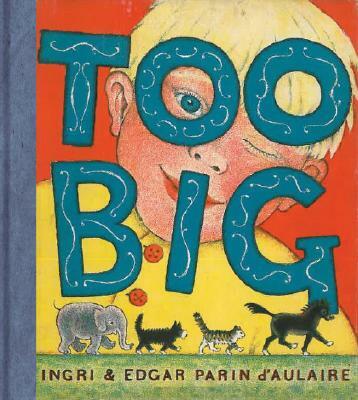 In glowing primary colors, Ingri and Edgar Parin d’Aulaire, famous for their luminous retellings of the Norse and Greek myths, paint a charming portrait of a typical toddler feeling his way into the world. Based on a story that enchanted the d’Aulaires’ own little boy, Too Big is a wise and winning tale of growing up and discovering that though there are some things you just can’t do, that still leaves everything you can. Ingri Mortenson (1904–1980) and Edgar Parin d’Aulaire (1898–1986) met at art school in Munich in 1921. They married in Norway and moved to New York in 1929. They published their first children’s book in 1931. The d’Aulaires worked as a team on both art and text throughout their joint career, publishing more than twenty picture books and receiving high critical acclaim for their distinguished contributions to children’s literature.